It’s been a very busy few weeks for the Planet Hunters science team. Chris submitted his paper and posted online announcing the discovery of two more planet candidates. In addition, I submitted (finally!!) my paper detailing the results of the Q1 classifications looking for short period planets and how well we do at finding transits from planets 2 earth radii and larger. So stay tuned , more on the results from my paper in about a month when we’ll get the referee’s report back. Also the Kepler team have released their newest list of planet candidates in their latest paper which includes an excellent section on Planet Hunters and several co-discoveries of candidates that were on our candidates list that you’ve helped us find (more on that tomorrow). The Kepler team have announced a whopping 2321 planet candidates orbiting 1790 stars. This includes 368 planetary systems with multiple transiting planets. We’re in the process of updating the Talk labels to identify those new candidates and new multiplanet systems found by the Kepler team. A really nice website for looking up and sorting the planet parameters and host star properties of this latest batch of Kepler planet candidates is the NASA Exoplanet Archive and also the Kepler website has a cool tool called the Kepler Planet Candidate Data Explorer that allows you to plot the distribution of the candidates in terms of the planet properties and stellar properties or anything else you might be interested in looking at. As you probably know, the second planet candidate KIC 10005758, detailed in Chris’s paper, was part of a multiplanet system where there are two planets transiting the host star. 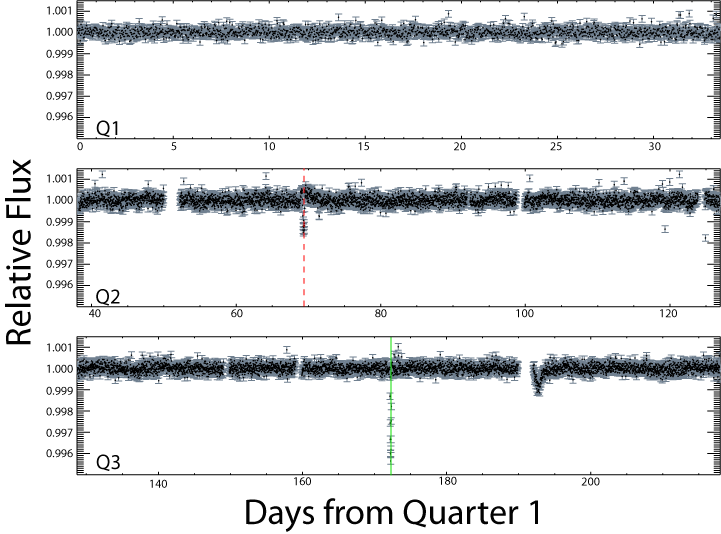 We found the longer period planet that first transited in Q2 and the Kepler team found the short period planet that had more than 2 visible transits in the Q1-Q6 observations. I’ve plotted the Q1-Q6 light curve below – the dashed red line is our Planet Hunters candidate (3.79 Earth radii with a 284 period orbit), the solid green (6.606 Earth radii with a period of 134.5 days) is the candidate identified by the Kepler team. I’ve been thinking more about multplanet systems lately. One question I have is, are there are longer period transits that might have been missed in these systems we think are currently single transiting planet system? 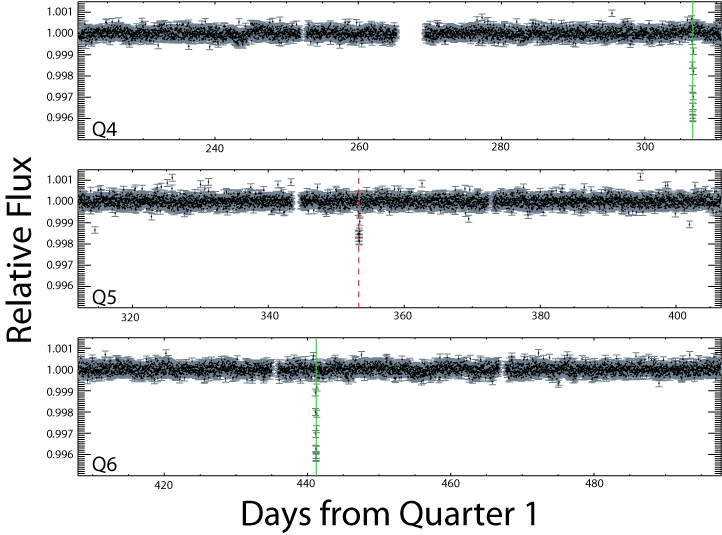 According to the Kepler team’s latest paper describing the new candidates list, they use a separate algorithm to look for repeating signals after they remove the known candidate signal from the light curve – if there aren’t many transits of the additional planet it might not show up when you look for periodic signals in the data. There are about 1420 single Kepler planet candidates. If anyone’s interested, I’ve listed them below with links to their source pages. Anyone fancy taking a look? Maybe we’ll find something interesting or some additional transits from a second planet.